Environmental Activists Warn Floating Sea Of Garbage Kills Birds and Sea Creatures. How much of this mess did you contribute? What are you going to do about it? The world’s cavalier disposal of plastic items, especially plastic water bottles, fishing gear and plastic bags, unknowingly causing the deaths of millions of land and sea mammals, fish, birds and reptiles annually. The oceans of the world are awash with choked dead fish, marine mammals, and water fowl, which become entangled in human debris. Shame on us! 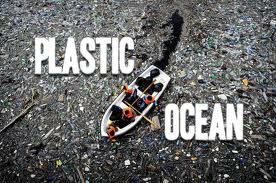 We have defiled the face of the earth with plastic refuse and contaminated our oceans with poisonous toxins. Since the advent of plastic almost a century ago, plastic remains a widely popular material used in a diverse variety of unique and innovative applications. Unfortunately, it never goes away. 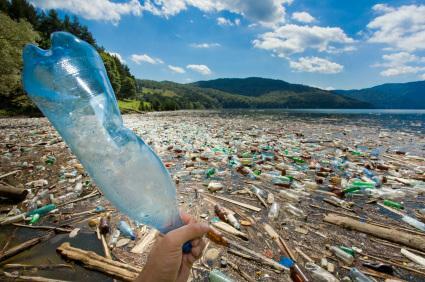 Plastic is used to make, or wrap around, the majority of the many household items we buy or use. The problem arises when we no longer want these disposable wrapping materials and how we elect to dispose of them. Plastic is handy, lightweight and easily discarded. Much too carelessly discarded. Plastic is easy and inexpensive to manufacture: lightweight, strong and durable. Unfortunately, the very qualities that make plastic such a useful building and manufacturing material create a horrific pollution nightmare. Plastic requires more than 300 years to photo degrade. Such a long life assures plastic survives in the environment for a lengthy time. Plastic fails to decompose readily and requires high-energy ultra-violet light to break down. Wake up people! The volume of plastic waste present in the world’s oceans is unconscionable. Now found in virtually all the ponds, streams, lakes, rivers, and oceans of the world, plastic defiles and contaminates even the most remote and once pristine waterways. The repugnant plastic junk that clogs oceans and inland water ways ranges from small broken plastic particles to commercial fishing nets, garbage bags, ice coolers, fishing tackle, toys, boat bumpers, rope, diapers and millions of plastic bottles. American explorer, oceanographer and environmental activist, Charles Moore advises the volume of plastic pollution in the world’s oceans is so extensive it’s beyond cleaning up. Returning home through the North Pacific Gyre after competing in the Trans Pac sailing race in 1997, Moore and his crew came upon an enormous stretch of stinking, floating debris. Twice the size of the State of Texas, a putrid, stinky mass of toxic plastic garbage swirls in the once sapphire clean waters of the Pacific Ocean: the junk soup covers more than a million square miles. Scientists named the rotten mess the “Great Pacific garbage patch.” Situated between San Francisco and the Hawaiian Islands, the vile thick layer of plastic refuse is beyond disgust and description. Moore’s crew documented 6 parts of plastic for every 1 part of plankton present in the ocean waters. 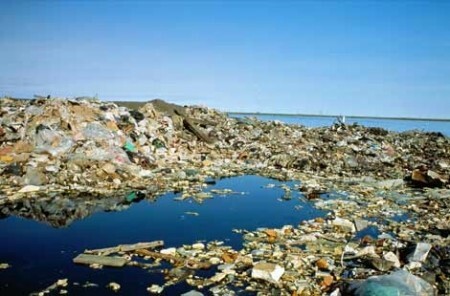 The floating garbage dump has increase more than 5 fold between l997 and 2007. 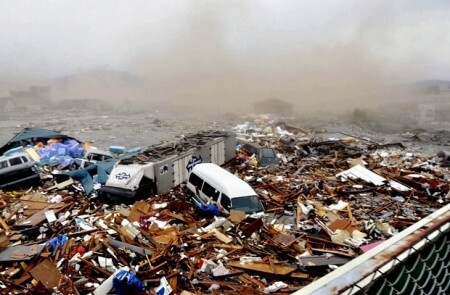 The divesting Japanese tsunami contributed millions of more tons of debris to the floating junk pile. Research studies indicate South Africa seabirds are the highest affected seabird population in the world. 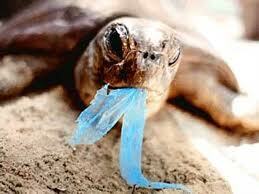 Plastics remain in the bird’s digestive systems, impeding digestion and causing starvation. While researchers remain unsure as to how much plastic the world’s animals, fowl and fish are ingesting, scientists universally agree plastic toxins in seafood are more than likely to cause harm when consumed by humans. Plastic is unfavorably compared with other toxic materials such as mercury. Plastic becomes an absorbent sponge when in contact with noxious chemicals and poisons such as PCBs. Absorbed within the plastic material, these toxins tend to concentrate at levels that are many millions of time more dangerous than levels found in uncontaminated in seawater. Scientific research studies implicate Ingredients found in plastic to reproductive abnormalities and many forms of cancer. Bisphenol A, found in plastic water bottles, produces cancer in lab rats. In lab tests of these mammals, plastic toxins were found to disrupt hormone levels and were associated with diabetes and obesity. Environmental actives and concerned scientists around the world voice grave concern that the massive swirls of floating plastic garbage located in the South Pacific may substantially contribute to global warming by casting a dense shade canopy that makes it impossible for plankton to grow or marine life to survive. On June 12, 2013, Australia News reported, Joeli Veitayaki, head of the School of Marine Studies at the University of the South Pacific, warns the whole of the Pacific is under threat from the increasing build-up of untreated sewage and garbage that pollutes the Pacific Ocean. Veitayaki stated that the problems arise from the immense amount of rubbish that is in the marine environment and the rivers and inland bodies that empty into the ocean. “It is the ocean the provides the bulk of the food that the people of the Pacific depend on – so if one looks at the problem from both those ends, one can imagine the seriousness of that problem.” Professor Veitayaki stated that Pacific countries depend on their waters not just for food, but also increasingly for exports such as tuna and seabed minerals. Professor Veitayaki said the changing nature of the garbage generated by Pacific communities means more education and new policies are needed. “They’re the ones that are on the line, the future of their communities is what we’re talking about, and it’s up to the to try and address the issue and give it the attention that it deserves,” he said. What is the world to do? Can you help make a difference? Although the task seems abysmal, “Together We Can Make A Difference”. The world crisis of plastic pollution demands extensive research and decisive action. Internationally, business and manufacturer must be encouraged to dramatically reduce the amount of plastic produced for packaging. Recycling needs to be a world imperative. Plastic wrapping materials and shopping bags should be required to carry warning labels advising of the dangers of plastic pollution. Consumers should be encouraged to use earth friendly shopping bags of organic, natural materials. Shout it loud! Act! Tell our local, state and federal lawmakers to enforce recycling and to find ways to limit plastic proliferation. The situation is dire and only continues to worsen with time. You can help by supporting re-cycling programs and promoting environmental awareness in your local community. Do your part! Be pro-active in demanding governments make changes and consumers to re-think their “throw-away” attitudes. Set a stellar example to your family, friends, co-workers and neighbors. Volunteer for neighborhood clean up projects. Get involved! Purchase only those products that minimize the amount of plastic packaging. Inform store management why you are doing so. United we speak with a loud voice when we speak with our dollars. Elect to drink tap or carbon filtered water from a glass lined reusable container. If you must purchase plastic bottles, dispose of the plastic container properly. Remember to recycle. With the world increase in global warming and environmental awareness, it is obvious we can do more to create a sustainable society. If we would all just take a few baby steps, choose to make a few different choices and consciously consider our impact on the planet, society can find a way to restore the world to its original beauty and regenerate its live-giving resources. Why is the world’s biggest landfill in the Pacific Ocean? 8 Responses to "So Wasted! 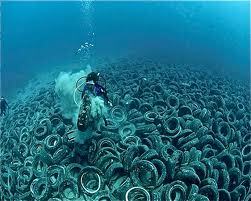 Great Pacific Garbage Patch Poisons Marine Life – Environmental Activists Wage War"
Excellent goods from you, man. I have understand your stuff previous to and you’re just too excellent. I actually like what you have acquired here, certainly like what you are saying and the way in which you say it. You make it entertaining and you still take care of to keep it sensible. I can’t wait to read far more from you. This is really a wonderful web site. Very helpful! Is there anything else I should know next? Or is this sufficient? Nice post. I be taught one thing tougher on different blogs everyday. It will all the time be stimulating to read content from other writers and observe just a little one thing from their store. I’d choose to make use of some with the content on my weblog whether you don’t mind. Natually I’ll offer you a link in your internet blog. Thanks for sharing. There weren’t any better sources than Wikipedia and ScienceHowThingsWork.com?